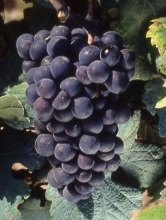 This variety is a mutation of Pinot N, particularly bearing on villosity. There is no officially recognized synonym in France for this variety. In the European Union, Meunier N can officially be called by other names: Mlynarka (Czech Republic), Müllerrebe (Germany), Pinot Meunier (Germany, Belgium, Spain, Czech Republic, United Kingdom), Schwarzriesling (Germany, Austria, Czech Republic) and Wrotham pinot (United Kingdom). In France, Meunier N is officially listed in the "Catalogue of vine varieties". 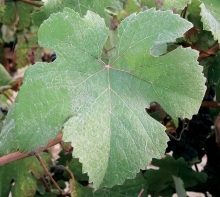 This vine variety is likewise listed in the Catalogues of other European Union member states: Germany, Austria, Belgium, Bulgaria, Spain, Great Britain, Italy, Netherlands and the Czech Republic. - round-shaped or short elliptical-shaped berries. Bud burst: 3 days after Chasselas. Grape maturity: period I, 1/2 weeks after Chasselas. This variety is rather productive and is resistant to winter frost. Fruit bearing is likewise fairly good following spring frost. Tendency to grow many water and new shoots. Meunier N is well suited for limestone terroirs and would appear not very sensitive to chlorosis. Meunier N is not very sensitive to phomopsis, oidium and powdery mildew. On the other hand, it is sensitive to grape catepillars and grey rot. Grape clusters are small and the berries very small. This variety is used especially for making sparkling wine and is used for producing moderately acidic wines which evolve quickly. The 14 approved Meunier N clones carry the numbers 458, 791, 817, 818, 864, 865, 900, 901, 916, 924, 925, 977, 978 and 983. A conservatory of 195 clones has been set up in the Champagne vineyards since 1995.